SkyFii: Queen Victoria Building | Ruckus Wireless Inc.
SkyFii is an Australian hotspot provider with a vision of bringing free, high-quality Wi-Fi access to the country, using an advertiser-supported model that has proved successful in the US, the UK and parts of Asia, according to SkyFii director Wayne Arthur. “There currently isn’t a ubiquitous free Wi-Fi network, of a consistent quality to serve mobile device users across Australia,” he observed, but said SkyFii has the opportunity to fill that role. The SkyFii service is funded through the delivery of rich content on behalf of advertisers. Traditionally users must watch around 15 seconds of advertising before their devices are registered on the network. This is a great proposition for advertisers, as it delivers the full attention of a mobile audience. “There’s proven benefit in this marketing approach for the advertiser,” said Arthur. 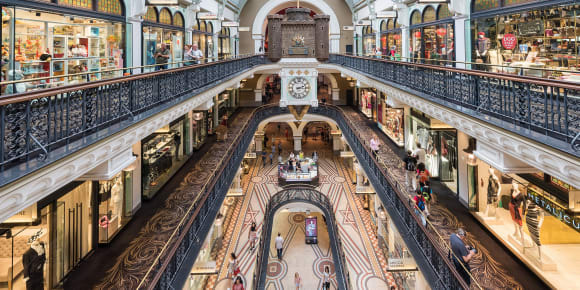 Among the first locations to offer SkyFii’s Wi-Fi service are four Sydney CBD shopping centres operated by Ipoh Pty Limited, including, QVB (the Queen Victoria Building), The Galeries, The Strand Arcade and Chifley Plaza. “As Queen Victoria said, we are not interested in the possibilities of defeat” Arthur smiled. After seeking proposals from multiple service providers, SkyFii selected to work with BigAir who put forward Ruckus Wireless Smart Wi-Fi to complement its network services and Internet connectivity, in order to achieve the required quality of service.